The 65ZF9 isn’t the world’s sexiest TV. Once assembled upon its oversized feet, it’s pretty much just a black rectangle with a chunkier-than-usual back end. It is extremely well built, though. Its connections are forward-thinking. The four HDMIs all handle 4K HDR at up to 60Hz, and there’s even support for ‘eARC’ capability, where the TV can pass object-based audio, such as Dolby Atmos, to compatible AV receivers/ soundbars. There’s also provision for file playback via Bluetooth, DLNA and USB stick. The 65ZF9 delivers a number of major feature boosts over its ZD9 ancestor. Most noticeably, it carries the new Android TV 8.0 smart interface. This isn’t perfect – the way its home page takes over the whole screen is annoying – but its far more slick and stable than previous Android implementations on Sony flatscreens, and features some helpful design and organisation refinements. The 65ZF9 also works with Google Assistant voice control, and supports Chromecasting from compatible devices. More significant from a home cinema movie-watching perspective is the ZF9’s use of Sony’s newer X1 Ultimate processor. This promises to deliver improved 4K upscaling and better colour accuracy; more refined SDR to HDR conversion; a Netflix Calibrated mode that adjusts the TV’s settings to get close to those use by Netflix content creators; greater motion handling; and revolutionary viewing angle improvements. These latter two X1 Ultimate benefits warrant further attention. The processor’s motion improvements combine new algorithms with the Sony X-Motion Clarity system first introduced on the brand’s X900F TVs. This partners black frame insertion (BFI) technology with the TV’s local dimming engine, to counter the dullness usually associated with BFI systems. The viewing angle upgrade sees the X1 Ultimate processor working in tandem with a new optical panel design. The result is effective viewing angles (before contrast and colour drop off disastrously) that nearly match those of OLED TVs. This is a huge leap for LCD technology, and forms part of Sony’s strategy for getting such displays as close as possible to the picture quality of its BVM-X300 OLED studio mastering monitor. As with the ZD9, the ZF9 is a VA panel that uses direct lighting and local dimming. Surprisingly, though, where the ZD9 had more than 600 dimming zones, the ZF9 only has around 100. The company says its new local dimming algorithms should compensate for the dimming zone reduction. This step-down in back-lighting nuance no doubt part explains why the 65ZF9, is much cheaper at launch than its predecessor. So, what’s my gripe about the TV’s black levels? Well, the lovely deep, rich blacks of the ZD9 have been replaced here by a pervasive wash of greyness, along with distracting amounts of backlight blooming around stand-out bright objects. The cigarette lighter-lit form of Patrick Hockstetter, as he foolishly explores the dark sewers in It (Ultra FID Blu-ray), is a perfect example of a TV struggling to cope with a (tricksy) source. And this is despite the ZF9 taking advantage of Dolby Vision’s contrast improvements with the It 4K BD. I can only speculate about what’s caused this problem. Presumably it’s a combination of the reduced number of local dimming zones and new viewing angle technologies. But whatever the reason, its effect on picture quality is unfortunate to say the least. Trying to put this disappointment aside, there’s no doubt the X1 Ultimate processor is able to conjure some impressive, eye-catching image quality elsewhere. The colour refinement on show throughout It is exemplary, for instance. There’s no striping in the ironically bright skies above Derry, while the demonic clown and his portentous balloons enjoy a gorgeously three-dimensional look, thanks to the way the X1 Ultimate processor delineates even the most minute colour shift. This revelatory colour tone ability also makes largescale shots, such as those across Derry’s rooftops or around the town’s lake, look extremely sharp and detailed. As 4K, in fact, as I’ve ever seen them. Credit where it’s due: it’s hard to think of another set that delivers such a consistently crisp picture without looking forced or obviously processed. Motion is handled superbly by the new X1 Ultimate/X-Motion Clarity hookup, ensuring that judder appears natural, and motion blur is pretty much non-existent even during It’s slyly fluid panning shots. The TV lives up to its ‘Clarity’ billing. The 65ZF9’s image is also phenomenally bright. 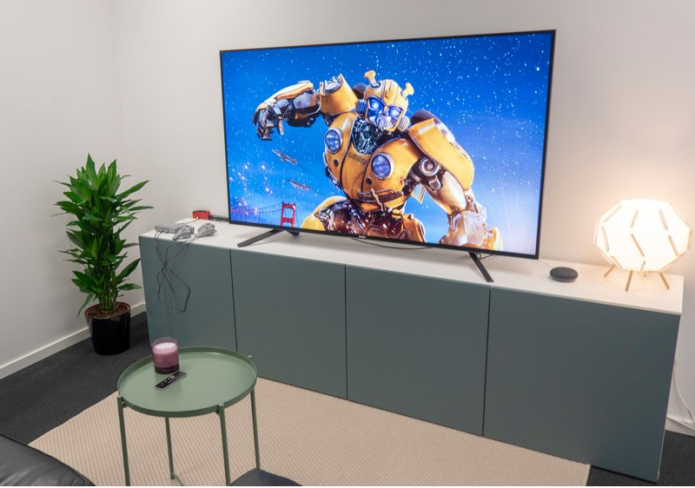 A measured 1,500 nits on a 10 per cent white HDR window in Vivid and Cinema modes doesn’t reach the over 2,000 nits delivered by Sony’s 1,000-dimming zone 100in ZD9 TV, but is still a top-tier figure, and hugely important to unlocking the potential of the HDR and wide colour features of 4K Blu-ray. Strangely, the light output drops to around 1,250 nits in the all-round best Standard mode – perhaps in a bid to reduce the greyness and blooming problems? Having mentioned blooming again, I’ll add that colours can lose some of their naturalism where it appears. And the general greyness over dark scenes can skew the accuracy of darker tones. Joining the mixed movie playback is a good but not flawless audio performance. There’s power and volume aplenty from the 2 x 10W speaker array, exhibiting clean, pure treble details and a decent amount of uncoloured bass. The soundstage spreads far beyond the TV without losing cohesion, meaning It’s creepy mix keeps you on edge. Voices sometimes seem to be ___ coming from below the screen, however. Sony gets a lot right with this innovative, intelligent 4K LCD TV, but it doesn't retain the cinematic appeal of its ZD9 predecessor. IT: Prepare for this year’s sequel with Warner Bros’ accomplished Ultra HD Blu-ray release of the chilling Stephen King adaptation – a Dolby Atmos mix heightens the sense of terror, while Dolby Vision visuals offer testing demo scenes.